The places these transnational migrants seek to go, however, struggle to address the challenging and complex issues associated with regulating the movement of people from one country to another. An interdisciplinary symposium hosted this week by the University of Notre Dame’s Institute for Latino Studies aims to bridge that divide, facilitating conversation and collaboration between scholars from the United States and Italy who are researching issues related to immigration. “Transnational Migration in Comparative Perspective: Italy and the United States,” held from Oct. 21 to 23 at Notre Dame’s Rome Global Gateway, offers the chance for academics to learn from one another about each country’s immigration experiences and discuss ways that research can better inform policymakers. 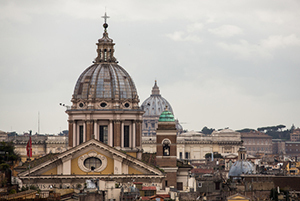 Other participants include faculty members at the University of Milan, Pontifical Urbaniana University, John Cabot University, Sapienza University of Rome, the University of Bologna, and Universitä Cattolica del Sacro Cuore and Fondazione ISMU. For a complete list of participants, see the program schedule here. The symposium draws on the dynamic, interdisciplinary research on migration being conducted at Notre Dame, including work with the United Nations and World Bank that has helped refugees become more self-reliant and entrepreneurial. One researcher’s work in this field, anthropology professor Rahul Oka, was recently featured in an installment of Notre Dame’s “What Would You Fight For?” video series airing nationally on NBC. “Refugee camps are designed to be temporary solutions, but the vast amount of war and political upheaval over the last decade have sadly turned them into permanent homes. Most of the people who go into camps spend the rest of their lives there,” Oka said. Media interested in speaking with researchers from the conference can contact Luis Fraga at lfraga@nd.edu. Oka is available for media comment at Rahul.C.Oka.1@nd.edu.